There is no question that Jodo Shinshu, the denomination founded by Shinran, is the most popular among the Pure Land schools. However, it would be a mistake for an outsider to label it as "typical" or "normative" since all the schools of Pure Land Buddhism see theirs as the best or most correct one. If anything, it comes close to being one of the most radical Pure Land schools. 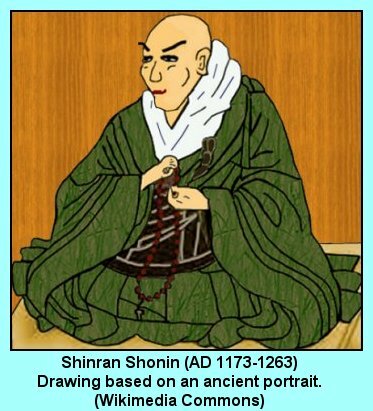 As is true for other well-known Japanese Buddhist teachers, Shinran was given several names along the way of his life's pilgrimage. He first came into the world under the name of "Matsuwakamaro." During his time as a Tendai monk, he went by "Hannen." Then later, as a disciple of Honen, he was first called "Shakku" and then "Zenshin." Subsequently he adopted "Shinran" in honor of two of the seven "patriarchs" by combining a syllable from each of the Japanese versions of their names: "Shin" from Vasubhandu ("Seshin") and "ran" from Tanluan ("Donran"), and that's the name by which the world knows him. Many centuries after his death, he received the honorific title, Kenshin Daishi. However, one of his favorite names for himself was "Gutoku," which meant "the Shaven Fool" or "the Foolish Shaven One," thereby expressing his self-image as one who is not worthy of honor himself, but owes everything to Amida Buddha. For the sake of convenience we shall refer to him as Shinran throughout the description of his life. Shinran belonged to the next generation after Honen. Their lives were deeply intertwined and followed similar patterns. There is little known about the fate of his parents; he may have been orphaned by the time that he was nine years old when an uncle set him up to study on Mt. Hiei under the leading Tendai masters of his day. He spent twenty years there as student and priest, but eventually became seriously disillusioned. Contributing to his negative attitude were his perception of Tendai teaching as futile as well as the evident corruption of many monks and their leaders. Most importantly, Shinran was unhappy at the lack of spiritual progress he saw in his own life. So, at age twenty-nine, he received permission to take a leave of absence for the purpose of meditating for a hundred days in seclusion. Shinran chose the Rokkakudo Temple built by Prince Shotoku in the sixth century as his venue. Shokotu had supposedly built that temple at the behest of the bodhisattva Avalokitesvara, who is frequently worshiped under a female form, known as Guanyin in China and as Kannon in Japan. The story is that on the ninety-fifth day of the retreat this very same Prince Shotoku appeared to Shinran in a vision and conveyed two important points of information to him. Very soon he would find a teacher who would provide him with the message that he was looking for. In the near future, the Kannon would come to him in the form of a human woman; they would fall in love and be married for the rest of their lives. Shortly thereafter, Shinran encountered the the sixty-nine year-old Honen and embraced his teachings on Amida and the nembutsu. Although Shinran was apparently a highly devoted and capable disciple of Honen, there was not sufficient time for him to earn the seniority of some of Honen's other disciples. Nevertheless, there was a strong bond between Honen and Shinran, and the latter preached the message of the former with great enthusiasm and success. In the year AD 1207, teaching the fundamental doctrines of the Pure Land schools was prohibited by the government. At least two monks were executed for converting two female courtesans to their beliefs; most of the others were sent into exile. On the last page, we saw that Honen had no sooner reached his destination than he was given permission to return to the mainland of Japan, barring only Kyoto. Shinran did not fare as well. He was defrocked as an officially recognized monk and sent to live as a lay person in the distant inhospitable province of Echigo. After having been a monk since childhood, he could not easily shed that identity, though he tried. On the other hand, this time of distress also strengthened his faith in Amida and the nembutsu, and--similar to Honen--he taught the people of Echigo about this doctrine. The ban was not lifted until late in AD 1211, which meant that he had spent almost a full five years in Echigo. His ordination was restored, but he did not leave Echigo another three years. At some time, Honen married Eshinni, a Buddhist nun who had adopted the Pure Land faith as well, but an important question is when in his life the wedding took place. Summaries of the life of Shinran often point to one of three possibilities without giving further qualifications, but the sources are not consistent with each other. The three obvious possibilities are 1) before the exile while he was following Honen; 2) during the exile; and 3) after the exile. In the previous sages of Pure Land Buddhism, we saw how the emphasis moved increasingly away from "self-power" to "other-power," by which is meant that human beings must rely on someone or something other than themselves in order to attain the Pure Land or nirvana. That "someone" was, of course, the Buddha Amida and the "something" was his vow. The practice of reciting the nembutsu as a means of calling on Amida's name at first was thoroughly embedded within other obligations that came with being a serious practitioner of Buddhism. By the time we got to Honen, the requirements had become highly simplified. He taught that merely reciting the nembutsu was sufficient, and that all other works were merely aids in that central display of faith. As a consequence, Honen allowed that even the worst of sinners could gain rebirth in the Pure Land. But the people of the world constantly say, even the evil person attains birth [in the Pure Land], how much more so the good person. Although this appears to be sound at first glance, it goes against the intention of the Primal Vow of Other Power." As best as we can ascertain, it was not Shinran's intention to found a school that competed with Honen's. He merely saw himself as carrying on the teachings of Honen and the other six "patriarchs" of Pure Land Buddhism. Shinran's disciples, however, were fully aware of the difference between the two masters and, thus, established their own sectarian identity as Jodo Shinshu, the "True School of the Pure Land."